This page provides information about the governance of Scotland’s 2018/20 Open Government Action Plan, including an overview of the steering group, secretariat and how the wider Open Government Network will be involved throughout the life of the plan. You can download the PDF version here. 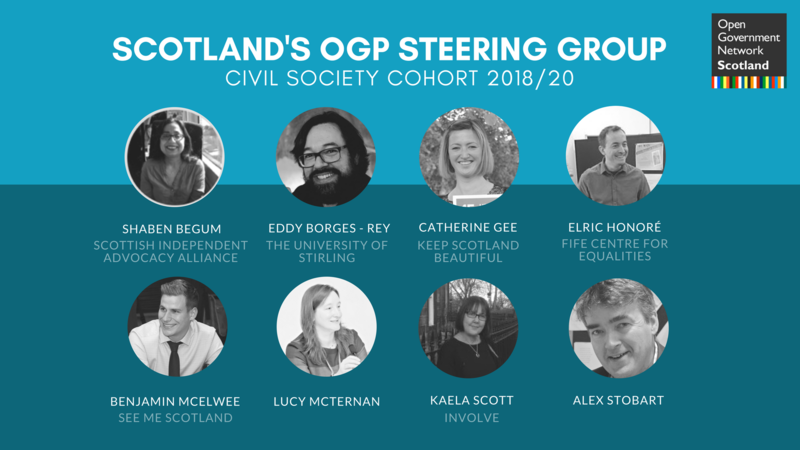 The OGP Steering Group is responsible for the strategic direction and decision making relating to the development, delivery and monitoring of Scotland’s 2018/20 Open Government Action Plan. There is equal civil society and government membership, with 8 representatives from each. The Network has undertaken an open selection process to secure members for the committee. The Scottish Government provide secretariat support to the Steering Group, with agendas and papers co-developed and notes of meetings published online. 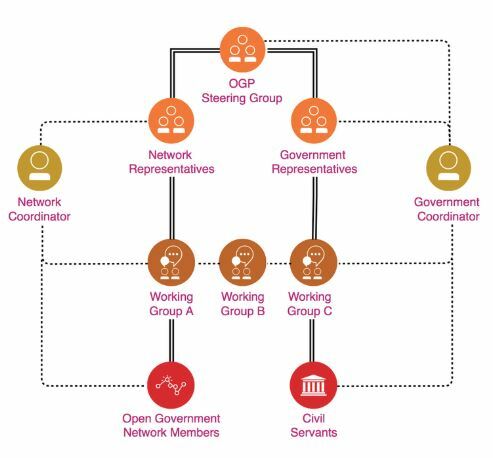 The Open Government Network’s Coordinator provides support for civil society members of the Steering Group and serves as the main point of contact for the network. The Steering group is supported by short life working groups to be determined by the Steering Group. Working groups will comprise equal numbers of government and civil society representatives where possible and will be overseen by two members of the Steering Group (1 government, 1 civil society) working jointly to guide and support the work. Scotland’s Open Government Partnership (OGP) Steering Group consists of eight Government Representatives and eight Network Representatives. The Steering Group is supported by short life working groups set up as and when needed throughout the course of the 2018/20 Action Plan. Supported by the Network’s Coordinator, Network Representatives on the OGP Steering Group are expected to regularly report to the Network on progress to maintain transparency, accountability and participation. Network Representatives will make it simple for the wider Open Government Network and public to inspect their work as members of the OGP Steering Group. Communications between Representatives will take place in a dedicated group on the online forum, civil society papers will be published online and decisions made by the group will be presented in a clear and understandable way. Network Representatives will work closely with the Coordinator to report on their work to the Open Government Network. Representatives are expected to update members following meetings of the OGP Steering Group, and will provide an update report every six months as part of the process for monitoring effectiveness of Network Representatives on the Steering Group. Network Representatives will seek the input of the network throughout the design and delivery of the Action Plan. This includes via the online forum, network meetings and short life working groups jointly held between the network and government. There is also the opportunity for network members to stand-in for a Representative unable to attend the OGP Steering Group. The Civil Society Coordinator will support Network Representatives to help guide and maintain the above principles of good governance. The Coordinator will work closely with the Government’s Coordinator to ensure effective and efficient collaborative working.